The return of the Tuesday teatime! On Friday we spent a wonderful hour and a half delighting in poetry, Shakespeare and each other at our teatime. Thank you for encouraging us to do this! Set the table with your favorite teacups and place treats on heart shaped platters. Have Bach playing in the background. Sip hot tea and read aloud from a vintage book of children’s poetry. Let out loud guffaws at the dog and cat who ate each other up and sigh contentedly when the Owl and the Pussycat dance by the light of the moon. Munch on cookies while you read Shakespeareâ€™s Taming of the Shrew. Be amazed at the timeless character lessons buried in this classic treasure. Grin back at him and nod. Serves as many as will come, until they are filled to overflowing. Send me your photos and stories! We need more to post so we can inspire other families to join in the Teatime Take-over! Winning hearts and minds of children into the Brave Writer lifestyle through shameless offerings of cookies, tea and poetry. Use julie [at] bravewriter [dot] com. Wow, this sounds right up my alley! Children, cookies, tea, and poetry~it doesn’t get much better than that. Are you serving great tea? Be sure to check out my article on my website, “A Tea Party’s Most Important Ingredient.” I just wrote yesterday about my five-year old’s love of real tea. 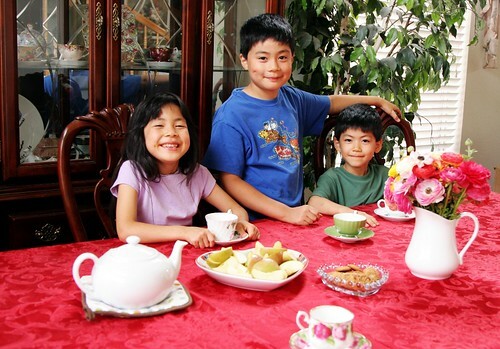 Julie, thank you for including our family’s teatime on your blog. We look forward to making more precious memories with a pot o’ tea!